NY Susquehanna & Western Railway (NYS&W) announced they're planning on removing the Callicoon siding without giving consideration to how detrimental this action is to this community and repercussions in the future. This siding is an important and unused asset in Sullivan County. This action by the town pretty much drives a stake into the heart of any future plans Mr. Wilson may actually have for storage or use of NYGL's equipment in this neighborhood. Sadly, it is quietly rusting away down in Port Jervis and indeed has been the object of vandalism. Mr. Wilson's credibility regarding the RR has probably been damaged by his false start on renovating the tumbledown Olympia Hotel in town and having a NYGL office, RR museum and the brewpub (which he opened in the old firehouse) situated there. 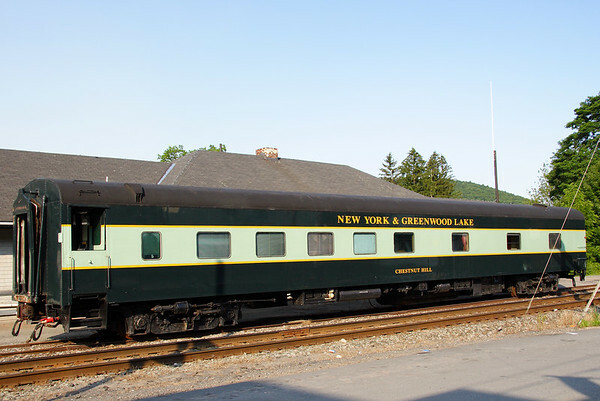 Here is a photo of JW's "Chestnut Hill" on the Callicoon siding back in 2006.